(Grattan Township, January 1, 2005, 6:00 p.m.) A West Michigan is dead man after falling through thin ice. Authorities say it's a real-life warning on what warm temperatures can do. Forty-five year-old Douglas Clark from Lowell died when he fell into Grattan Township's Byrne Lake Friday. Neighbors first heard Clark's cries for help, but by the time rescue crews could reach him, the wind, ice, and water proved to be too much. Also on Friday, in Cass County, Scott Rozeboom was on the ice and ended up in a similar situation. DOLLAR BAY - U.S. Coast Guard officials blame complacency and carelessness for most ice rescue cases involving snowmobiles. The U.S. Coast Guard's Ninth District offices of Public Affairs and Search and Rescue, based in Cleveland, Ohio, are working together to promote ice safety measures as a prevention technique in saving lives for the 2005 ice rescue season. To help promote prevention, the public affairs office has created a slogan to help inform the public. It reads, "Ice: a clear, solid risk." Now that inland lakes are freezing over, cutting-edge snowboarders are looking to the sky. 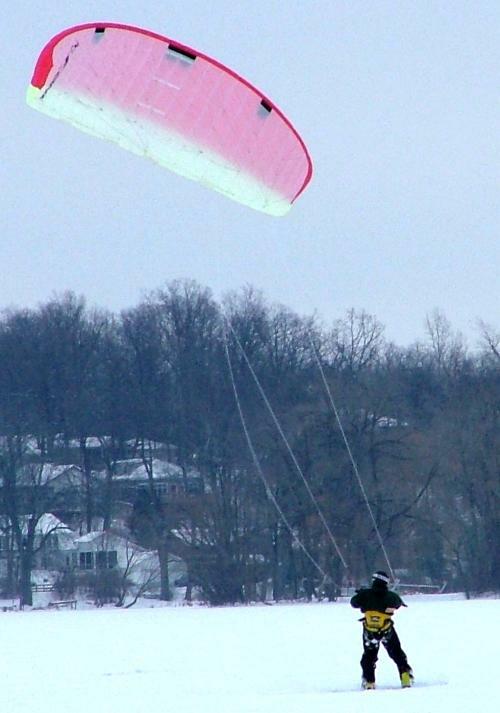 All they need is a steady wind, preferably 15 knots, to really get cooking across the snow and flying high in the air. No lift tickets required. No standing in line. Just a board, a kite and an open stretch of snow. 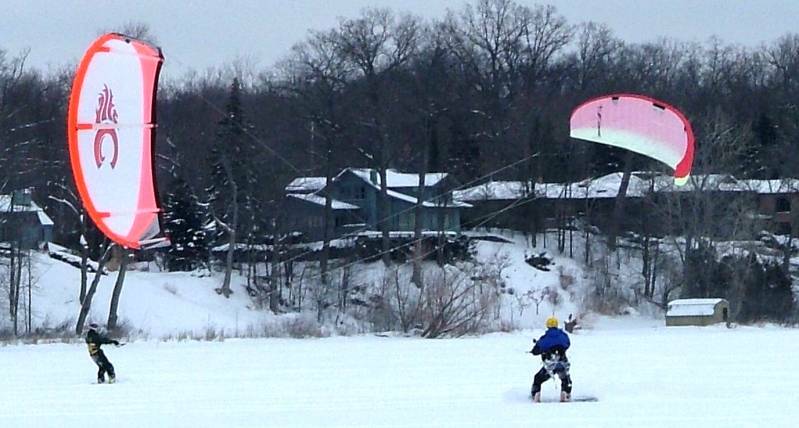 "The coolest thing about snowkiting is that you can go by yourself to an open, frozen lake after a snowfall and ride powder all day long," said Brad Knoth of Hudsonville said. "That's a big, big deal. It's what drew me into it." BAY CITY, Mich. (AP) â€” Harry Haney has built a sled that can walk on water. The 39-year-old's snow boat is a 14-foot custom-made aluminum craft welded into a standard snowmobile. The prototype has been named one of Time magazine's most amazing inventions of 2004. "I've been fishing a long time," Haney, a seasonal state park ranger from Rhodes, told The Bay City Times for a recent story. "It's just too spooky being on a sled that doesn't float. -- Our view: Wear your helmet, obey speed limits and do not drink and ride. There was encouraging news this week from the insurance industry: There were 29 snowmobile-related deaths last winter in Michigan, which makes it the safest season in recent years. Last year's relatively low number of fatalities came one year after 45 people died in the 2002-03 season, the deadliest in eight years. The traditional beginning of ice boating is placed in Holland in the middle 1600â€™s. The first iceboats were actually sailing ships fitted with ice runners. These vessels were used for moving cargo around the bays and canals adjacent to the North Sea. Over the course of time the iceboats original purpose would metamorphosis from a tool of labor to an agile racing machine. Vintage iceboat with a historic past is now skimming across White Bear Lake. If the wind is good and the ice is clear, you may see a piece of history glide by on White Bear Lake, where a group of men sail a century-old ice boat once owned by the Wrigley family of chewing gum fame. A ride across the ice in the Wrigley, as its owners call it, resurrects the grace and aura of a bygone era. "It's all about being on a boat that's almost 100 years old and still functioning," said Terry Thompson of Vadnais Heights. The Four Lakes Ice Yacht Club Grand Slam Regatta is tentatively scheduled for January 1-2, 2005 somewhere in the Madison area. Because of the unusually warm weather forecast, final announcement will be made at noon on Friday, December 31. Ice fishing on Saginaw Bay has been a way of life for area fishermen for over 150 years. We have heard news reports during the winter of fishermen getting caught on the ice in a "white out", losing sight of land and spending a night on the ice. It is also a little heart wrenching to see your car or truck go through the ice. MARQUETTE - Recent warm temperatures haven't deterred ice fishing enthusiasts from the tip-up prime time that occurs at the beginning of the season. Although the surface is mushy, anglers have confidence there is plenty of ice on inland lakes to support a person, if not yet a vehicle or heavy shanty. "The cold nights and cold days we had before Christmas stiffened 'er up pretty good," said Ernie Lindsey, co-owner of Wilderness Sports in Ishpeming. With subzero temperatures in December creating acres of frozen water, many ice fishermen on Anchor Bay are preparing for a successful winter fishing season. State and local authorities are reminding them what to do now and at the end of the season -- label ice shanties and get them off the ice when it starts to melt. About a half-dozen shanties are abandoned on northern Lake St. Clair at the end of each season, said Ron Pinson, state Department of Natural Resources conservation officer. PORTER | It is lovely, but potentially deadly. You almost expect to see penguins among the carved arches and mesas of shelf ice along Lake Michigan's southern shoreline, but the formations are only for looking, not touching, officials warn. "It doesn't freeze as solid as it looks," said Cliff Goins, public programs coordinator for the Indiana Dunes National Lakeshore. Shelf ice forms when winds from the north push waves up against Lake Michigan's southern shore. Breaking waves and spray freeze in frigid air temperatures, creating irregular ice formations.